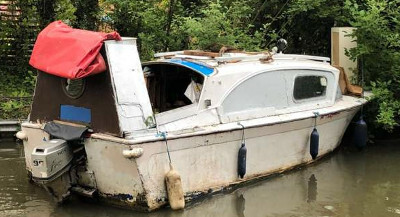 Thieves used boat for 'quick getaway'! THIEVES leaving a robbery thought a GRP cruiser would make a 'quick getaway' vehicle. But alas on the Coventry Canal it just would not go like those often depicted on television, so they gave it up and crashed it into the bank to make their escape, Roger Fox tells us. But the police had easily followed its journey and arrested the thieves who had been reported suspiciously leaving a building site. The cruiser was broken into by a window being smashed in and the thieves then finding the engine key inside, but was not left in too good a condition as the West Midlands Police photograph shows.